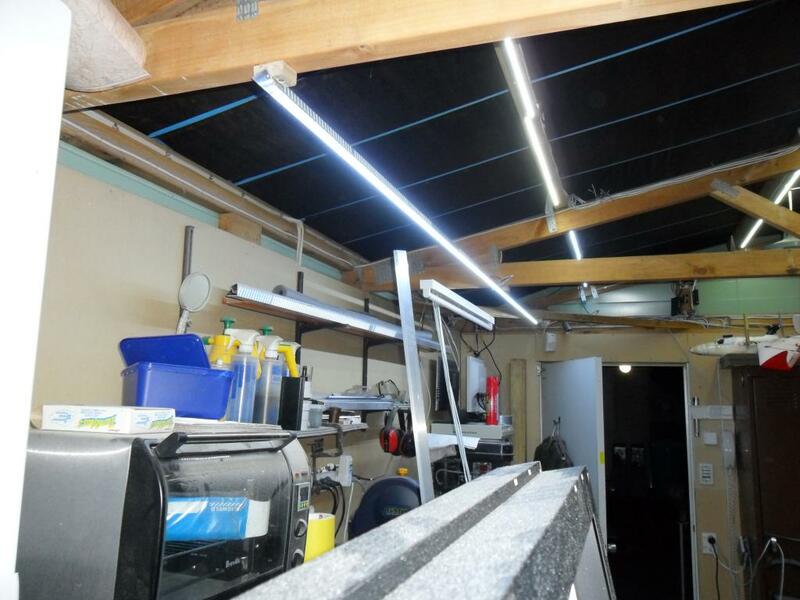 The garage-workshop was lit by four 200 watt incandescent lamps and two 4-foot fluorescents. Other than the huge power draw, the light was quite yellow and produced a lot of shadows. 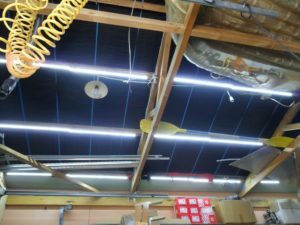 For some time the plan has bee to experiment with LED strip lighting for improved white light, fewer shadows and lower power draw. 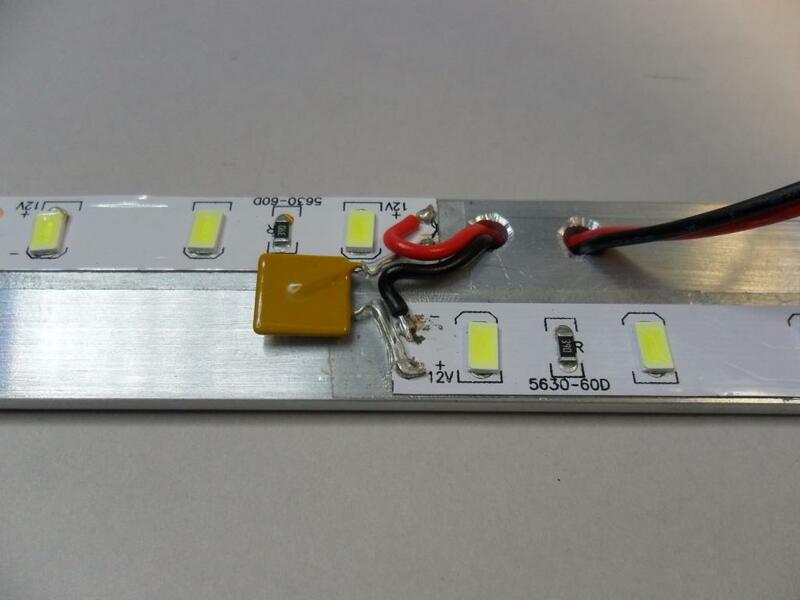 Low-cost LED strip is now readily available and seems to be good enough. Add some aluminium extrusion, low-voltage wiring, power supply and simple dimmers and it’s time to experiment. To make the system easy to manufacture, install and maintain, I decided to make manageable standard modules. 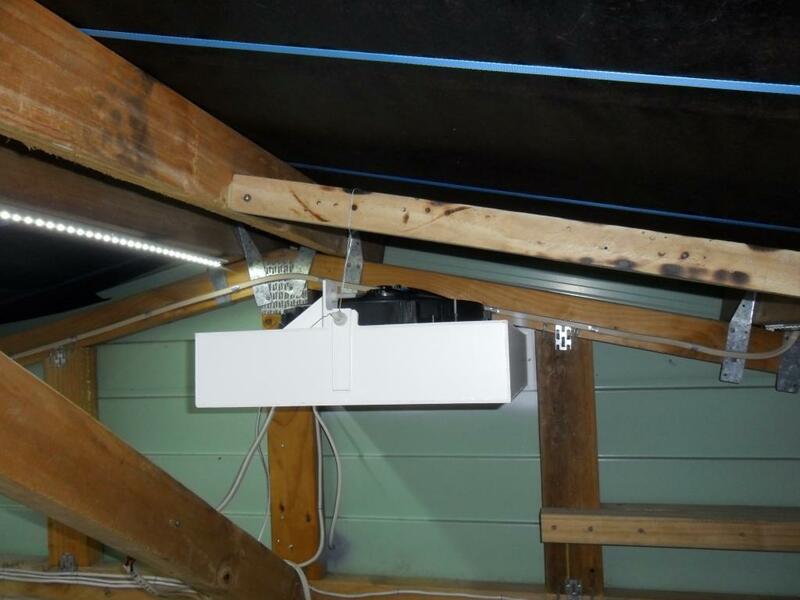 Using 25×3 mm extrusion, eighteen 1.6M lengths attached to the upper roof timber covers the entire garage. The LED strip is the standard non-waterproof, 5630 x 300 12V. 2-pole JST connectors allow easy connect-disconnect. Each module consists of two strips of 48 (96 total) 5630 LEDs wired in series for 24V operation. A 1.6A 30V PTC self resetting fuse provides over-current protection in the event of a failure or short. All connections are at the centre of the module. At 24V each module draws about 1.7A, but at 20V it drops to 1.15A and the light output does not reduce by much. So running at about 10 watts per module is produces less heat, almost as much light and the LEDs should last longer. Above the main workbench I have installed a 3 meter alloy angle with two full length LED strips. Each strip wired for 24V centre feed. Overall this is 38 watts at 20 volts. There are two main problems with this low cost Chinese LED strip, both relating to the sticky tape on the back. it does not reliably stick to most surfaces, even clean smooth aluminium. it is not an effective insulator when stuck to a conductive surface – aluminium. The sticky backing does not reliably stick to hold the strip in place. Especially when the strip has been in stock unused for a while. I found that when the LED strip was attached directly to aluminium extrusion, short circuits between the exposed traces on the back of the strip and the extrusion were not uncommon. Two opposing shorts on one module and the LED was shorted. The extrusion could also be live, connected to +ve or -ve of the main supply. 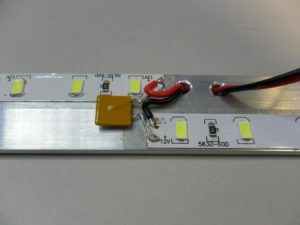 With two strips series connected, a short on one strip could applied 24V to the other 12V strip – causing LED failure and serious overheating. The sticky backing on the LED strip can not be trusted as an insulator. Another issue was the dodgy manufacturers soldering connecting LED segment on the reel. This must be checked and tested and improved where necessary. 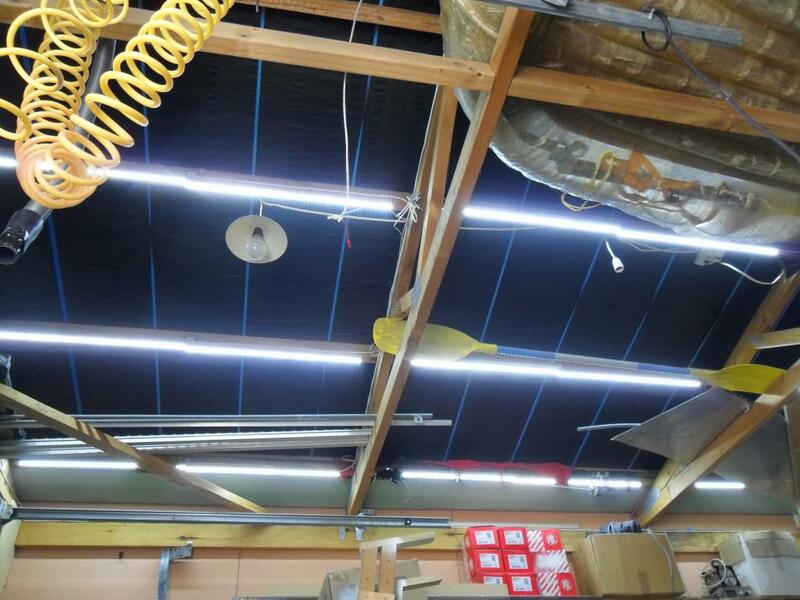 We are in early summer and while installing the lights I noticed that the roof space was very hot. The roof is about 30 square meters and painted a dark red-brown which attracts a lot of heat. On a clear day in full sun, well over 50 deg-C. So I decided to install an extractor fan. Having used mains powered fans before I knew that to be effective they were large and expensive and would not have suited the available space. There is only one suitable high end roof peak and not much room there. 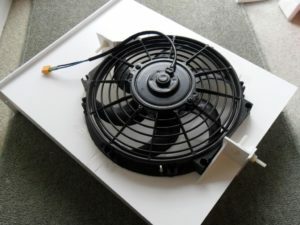 The fan has to move a lot of air and take it from as high as possible. I decided to try a box with rectangular outlet to match the metal weatherboard cladding and a 10 inch 12V automotive after-market radiator fan. 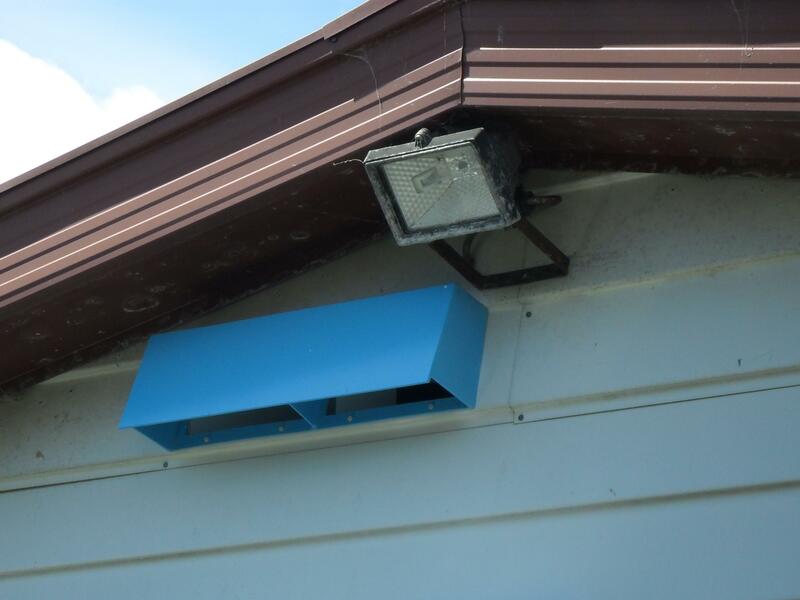 The box and outlet are assembled from 5mm foam-pvc sheet using PVC guttering cement. The inside left white and the outside spray painted for some extra protection. Installation required cutting a rectangular hole in the metal using a battery drill powered nibbler – which was a bit noisy – cleaning up the edges and priming. The outer shroud is sealed onto the outside with some roof and gutter silicon, although it’s protected by the overhang and should not often get wet. Ten long 3mm nylon screws hold it all together and in place. An extra brace supports the back end weight. The fan is not perfectly balanced but vibration does not see to be a problem. It did come with a mounting kit with springs, which may reduce the noise slightly. I am not sure yet if a screen to prevent insects or birds causing a problem is necessary, but suspect not. At 12V the fan is rated at 7A and 1000 cfm, is reasonably loud but not annoying inside the garage. Outside, most of the noise is from the air flow. At 10V the noise level seems to reduce more than the airflow. When I get the power supply mounted a thermostat will control the fan.